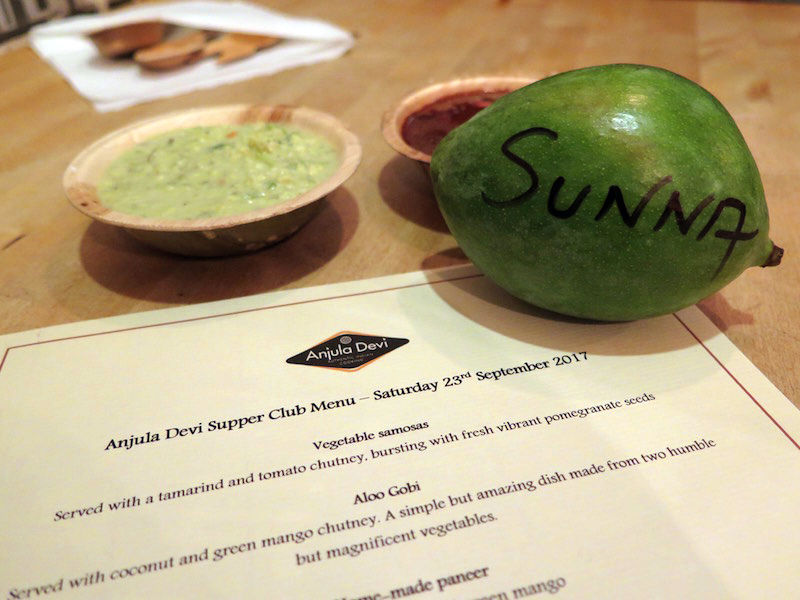 Last weekend I was lucky enough to be invited along to an Indian supper club with chef, Anjula Devi. The evening was part of #NCSupperClubs by Nesan Creations – a niche supper club brand founded by London and Bangalore based business entrepreneur, Nesan Thirunesan – who works with great chefs and cookbook authors to organise exclusive supper clubs in London. Anjula Devi is a talented chef who has appeared on many a cooking show, including a feature on BBC Food Shows. She is also the author of ‘Spice for Life’ with a great Indian kitchen product range under her name available at Lakeland. So I was very excited at the thought of being treated to a whole menu of her cooking. With a huge variety of dishes to taste for the evening, I was definitely spoilt for choice. There were incredible, homemade vegetable samosas to dip into tamarind and tomato chutney with pomegranate for starters, before a range of main dishes to try. Aloo gobi (potato and cauliflower) was served with coconut and green mango chutney that had a spicy kick to it. I’ve had this dish before but I’ve never paired it with a chutney, which made all the difference. 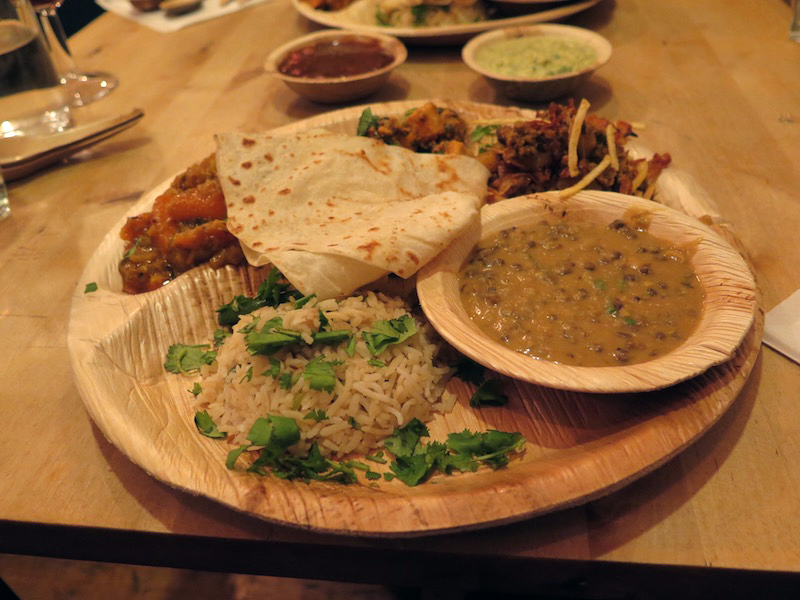 There was also a lentil dish, again with just the right amount of spice to it, served with fresh roti bread. A very rustic and authentic meal. 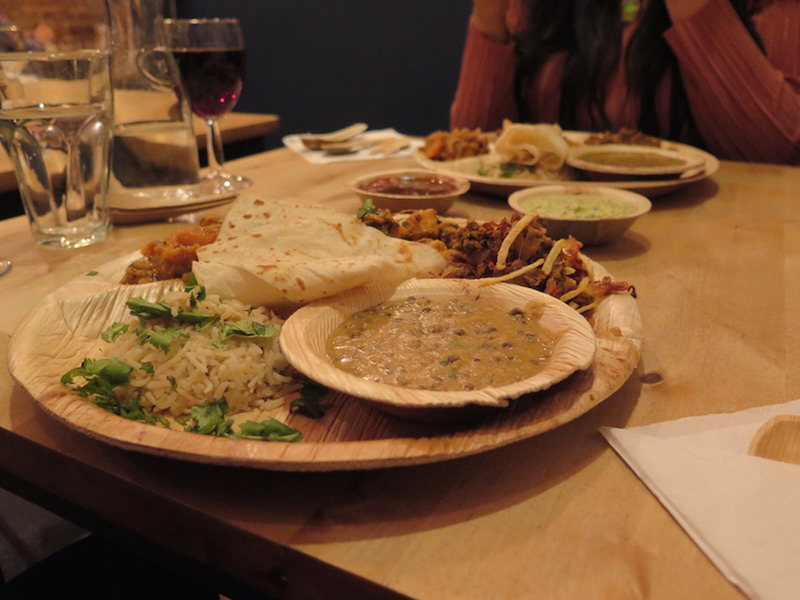 The meat dish consisted of keema mince and peas, garnished with potato chipsticks and crispy fried onions – a little twist that Anjula created. And of course, you can’t have Indian cuisine without a little side serving of fragrant pilau rice. Served simple and plain but with just as much flavour as everything else on the menu. But my favourite dish of all was the homemade paneer. Made with achaar pickles and green mango, it was unlike any other paneer I’ve ever tasted. 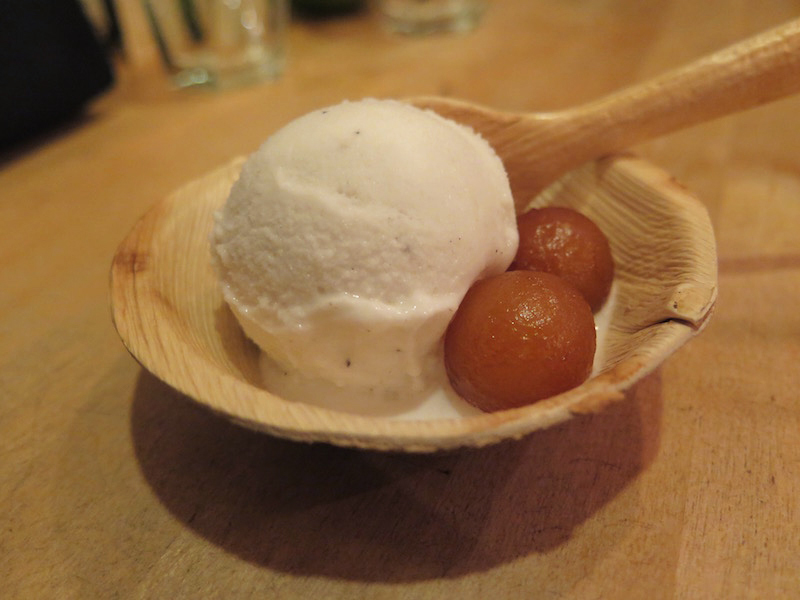 To end the evening there was a traditional Indian dessert of gulab jamun (soft, syrupy dough balls) that came with a scoop of coconut ice cream. A brilliant pairing and just what I needed after all the spices. 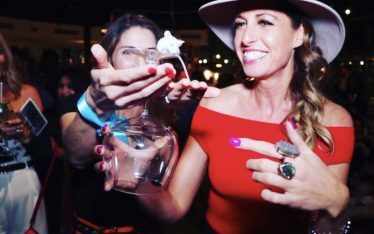 All the food was served with sustainable plates and cutlery made out of 100% fallen palm leaves that added to the rustic theme of the night. 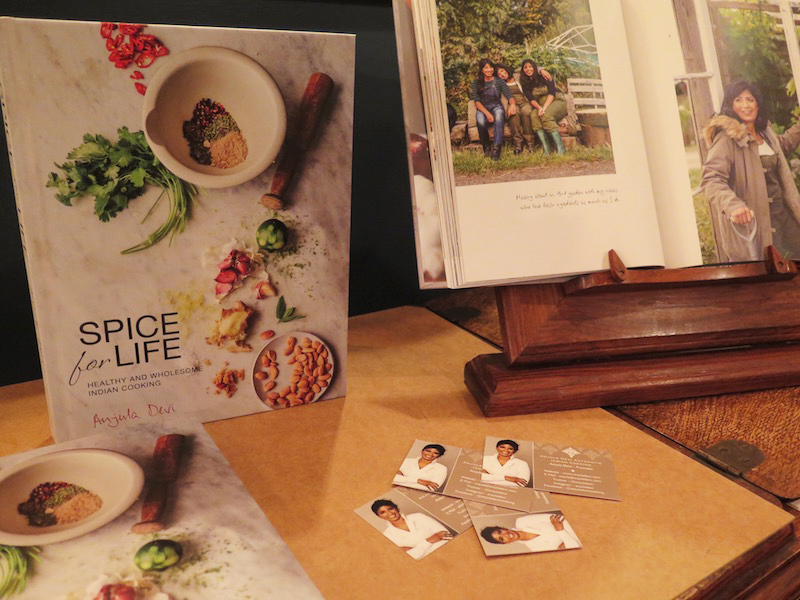 I was so blown away with Anjula’s cooking that I couldn’t help but get myself one of her cookbooks, ‘Spice for Life.’ I can’t wait to try out the recipes for myself. #NCSupperClubs clearly know how to pick their chefs and I can’t wait to find out who’s starring in their next supper club. 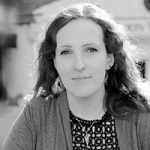 Keep your eyes out for their next events in October and November on Twitter, Instagram or email, and get your tickets fast to secure your place – trust me, you don’t want to miss it.